Click to open this poster full size and share with friends! 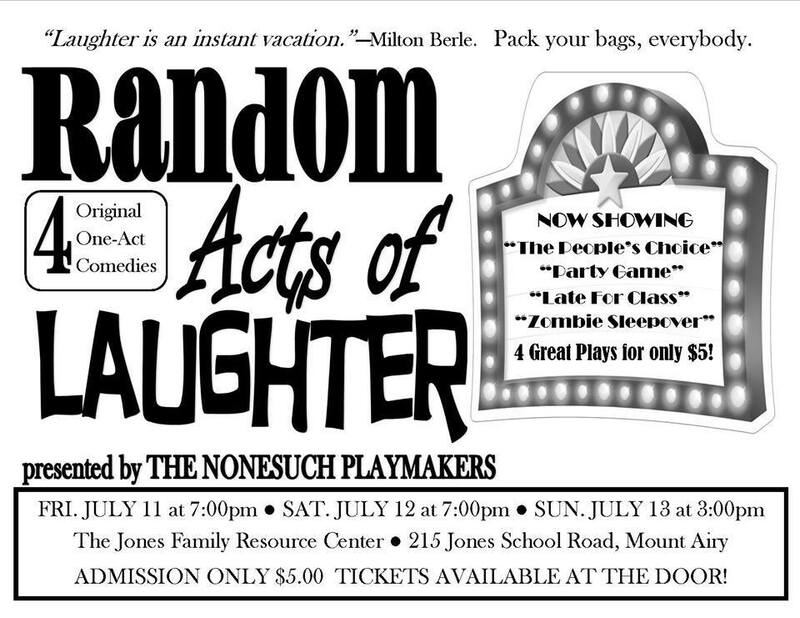 Four original one-act comedies designed to exercise the 80 muscles we all use when we laugh! Performed in the round (audience surrounding the performance space). A trio of powerful hotshots try to pull off the political scam of the century. It’s very exciting until everything—and we mean everything—goes wrong. An unhappily divorced couple has a chance encounter at a social gathering, where the former wife has come to escape, and the ex-husband has brought his new, much younger girlfriend. Get ready for the battle of the century! So you think you know some crazy people? Welcome to Professor Peterson’s Psychology 241 class. You ain’t seen crazy yet. A group of teenage girls are staying over at a friend's house. Through a misunderstanding, the girls believe that zombies have invaded their neighborhood. With no parents in the house, the intrepid girls panic first, then take their own unique (and hilarious) steps to defend themselves against the Zombie Apocalypse!